Pre-1870 John C. Heenan CDV by Fredricks. 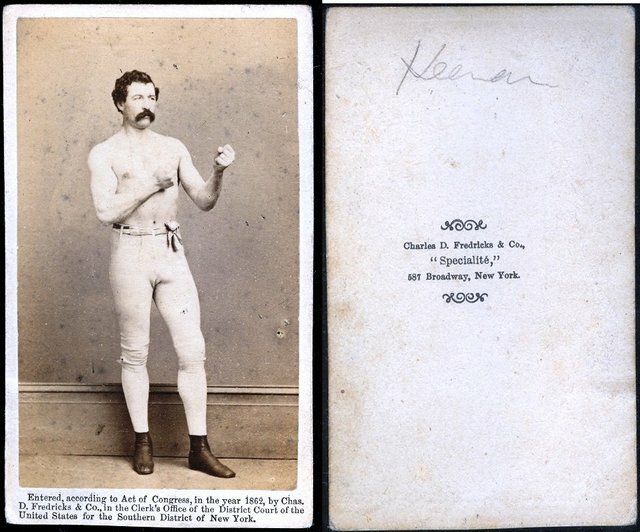 This is the earliest verifiable boxing card. Until the late 1850's the photographic technology did not permit commercial scale, affordable production of photographs. Fredricks was one of the first to make albumen images, a skill he learned in France and brought to the States in 1855. By the time this card was issued as part of his commercially produced "Specialite" series of famous personages, Fredricks owned a large studio and gallery in New York City. His work is featured in a number of museum collections, including the Smithsonian.